The other night I had the pleasure of hanging out at the freshly opened Chaya Beer Garden and it felt like a little bit of ‘someplace’ else right there in downtown. Colorful lanterns strung brightly over the patio and the heady smell of the outdoor barbeque lures you in like a curious puppy. 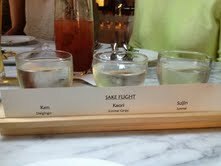 The flight of sake doesn’t hurt either. And, OMG, the food is delicious. The skewers of barbequed meat and veggies are terrific. Have you ever had barbequed tongue? No? You must. Don’t worry. They are cut in little squares so there is no semblance to an actual, you know, tongue. You’ll only know that you tasted something delectable. It’s a great place to kick back after work, hang out til the traffic abates but you can also make it a destination, it’s that good. Have fun and here are all the particulars. WHAT: From Tuesday, May 28, 2013 through Sunday, August 30, 2013 CHAYA Downtown kicks off the summer with the return of its eagerly-anticipated Summer Beer Garden series with a Summer themed BBQ menu taking place on the restaurant’s lush outdoor patio, debuting with a kick-off event on Thursday, May 30th featuring Taiko Drummers and a live band, as well as a DJ spinning Live on Thursday, June 6th. In addition to the traditional beer garden menu, CHAYA is excited to announce the Summer Sunday BBQ menu offered all day (12 p.m. – 8 p.m.), offering loft dwellers and local residents to enjoy a summer on the grill. Exclusively offered Sunday-Friday evenings at the Downtown LA. location, diners will be able to enjoy Executive Chef Atsushi Kenjo’s special menu featuring a variety of Kushiyaki Skewers ($2—$3) including Beef Tongue, Shrimp, Bacon Wrapped Dates or Shiitake, grilled to order on an authentic Hibachi grills flown in from Japan. Diners can also feast on a variety of hot and cold BBQ-inspired items such as Sweet White Corn with Feta Cheese, jalapeño aioli ($7); Grilled Yellow Peach with Burrata Cheese, Balsamic Must, Hazelnuts, Arugula ($10); Spiced Shrimp and Veggie Brochette with Chipotle Miso ($14); Polish Sausage with Sauerkraut, Whole Grain Mustard ($14); Drunken Whole Squid with Wasabi Guacamole ($12). Guests can quench their thirst with pitchers of specialty Japanese Biru including Kirin Beer’s premier frozen beer foam technology ($10), debuting exclusively at CHAYA as the first U.S. Restaurant to feature it, as well as, beer infused cocktails, housemade Sake Sangria ($6/glass), a Sake Flight ($15); or award-winning premium Japanese whiskeys. 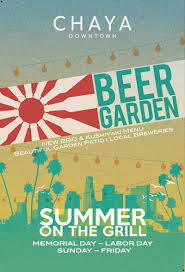 The outdoor patio will be festively decorated to re-create the traditional beer gardens found throughout Japan, featuring a traditional Yakitori Grill as well as a 6 ft Barbecue. CHAYA: CHAYA has an unprecedented 400-year history of restaurants owned and operated by the same Tsunoda family both in Japan and California. CHAYA began under an enormous shade tree in Hayama, Japan, centuries ago, where they offered tea, sweets and respite to weary horseback travelers. Today, there are two locations in Japan (Hikage CHAYA and La Marée de CHAYA) and four locations in California (Beverly Hills, Venice, Downtown L.A., and San Francisco).